Purified by ammonium sulphate precipitation. This antibody is provided as a 0.2µm sterile filtered solution. Our Abpromise guarantee covers the use of ab16132 in the following tested applications. WB Use a concentration of 1 - 10 µg/ml. Predicted molecular weight: 18 kDa. Acts with TAL1/SCL to regulate red blood cell development. Also acts with LDB1 to maintain erythroid precursors in an immature state. 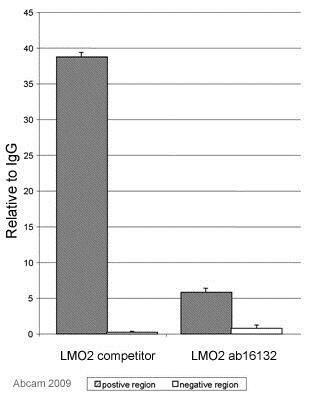 Note=A chromosomal aberration involving LMO2 may be a cause of a form of T-cell acute lymphoblastic leukemia (T-ALL). Translocation t(11,14)(p13;q11) with TCRD. The second LIM zinc-binding domain interacts with KDM5A. Publishing research using ab16132? Please let us know so that we can cite the reference in this datasheet.